Arriving in Niagara in 1956, a refugee from post-war military-socialist regime of Slovenia, formally part of Yugoslavia, young John Holer sought work in his profession: wine chemistry. Initially barred by his lack of English, he turned to farm labour, construction, and hospital service. He learned English, welding, and much more about his adopted country. By 1961, he had saved enough to open his own business. Buying many of his materials on credit against his expected revenues, he and a friend welded a 50-foot steel tank for the first sea lion performances. 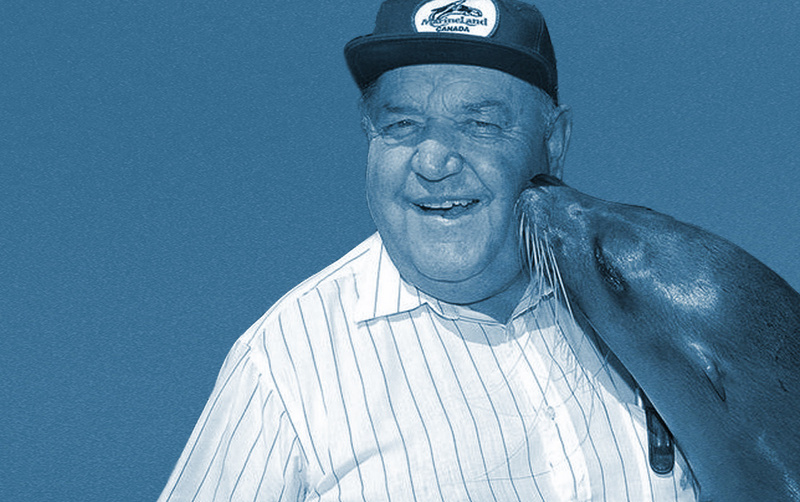 He ordered three sea lions from California, trained them, hired a ticket seller, trained another swimmer to perform with the sea lions, and tried to give his customers good entertainment value for the $.25 admission ticket. In addition to the performances, visitors could observe and feed the sea lions. He installed various obstacles and toys to make it even more interesting. Initially leasing a 3-acre piece of land from Harry Oakes, his new business was profitable the first year. Within two years it was doing very well and the initial debts were all paid back, establishing a policy of quick debt retirement that has continued throughout his business practices. Since then, his world-renowned, Marineland, has expanded many times. The first additions were some fallow deer. Then he added more land, picnic areas, food services, and rides. Marineland now owns the land; more than 1000 acres. The park undergoes continuous development, with additional attractions being added as his reinvestment program permits. The current grandstand holds 4000 people for each of the six daily shows by the sea lions and killer whales. At the time of this award, a massive new habitat was under construction for the killer whales and a safari area was being developed for native Canadian animals. Marineland has become a major destination for the regional tourism industry. It has become a very important adjunct to the great natural asset of the Falls. Marineland’s spin-offs contribute greatly to sales in the hospitality industry throughout Niagara. Unlike the natural attraction, however, Marineland is the product of human vision and drive. It is John Holer’s enterprise.